Four detained for possible involvement in banking hack and plan to pump stock value before selling. US and Israeli law enforcement agencies have arrested four people in Israel and Florida related to securities fraud tied to computer hacks of JPMorgan Chase & Co and other financial institutions, Bloomberg reported, citing sources. 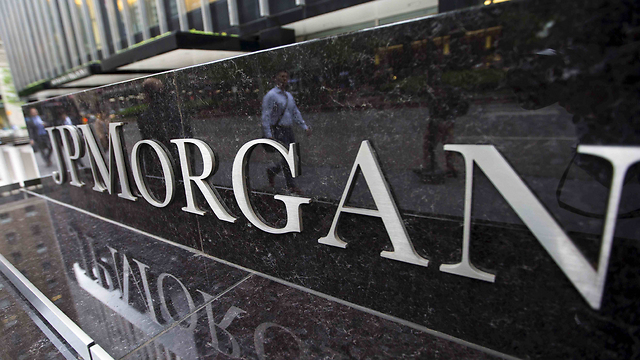 Israeli police spokesman Micky Rosenfeld said he did not have details of a scam involving JP Morgan but confirmed three arrests. "Three Israeli citizens were arrested on Thursday and have been remanded in custody, appearing in court in Rishon Lezion, near Tel Aviv," Rosenfeld told Reuters. A fifth person remains at large, Bloomberg reported, quoting officials. JPMorgan said last October that names, addresses, phone numbers and email addresses of about 83 million customers were exposed in a hacking attack, making it one of the biggest data breaches in history. In the indictment, which was unsealed on Tuesday, two people were charged with securities fraud in a plan to pump up the value of low-volume stocks, At least five stocks were manipulated in 2011 and 2012, according to the grand jury indictment, Bloomberg said. The Bloomberg report continued to say that, "The US said the defendants used mass e-mail campaigns and pre-arranged trading to artificially drive up the price and volume of targeted stocks, in a classic ‘pump and dump’ scheme. At one point, two of the defendants allegedly met with their New Jersey co-conspirator in Kiev, Ukraine, as part of the scam." 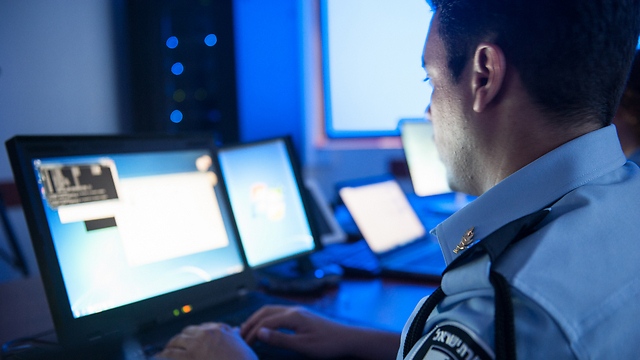 Israel's cyber crimes unit arrested two suspects on Tuesday, both of whom are residents of Israel. The arrests followed a joint investigation with American law enforcement authorities, with found evidence of securities fraud scheme within the US financial system. According to Bloomberg, the arrests follow a months-long investigation linking suspects to "one of the largest US bank hacks in history". FBI investigation spanning 20 countries ends in extensive arrests operation of members of malware forum Darkode; one Israeli suspected of aiding terror groups. Lahav 433's cyber unit arrested on Tuesday three Israelis involved in the world's largest-known English-language malware forum, an online marketplace called Darkode, where cybercriminals bought and sold hacked databases, malicious software and other products that could cripple or steal information from computer systems. More than 70 cybercriminals in 20 countries are targets of the FBI investigation. Some have been charged, while others were the subject of search warrants because some countries require evidence to be seized before criminal charges can be filed, investigators said. The three Israelis are suspected of launching attacks against websites, taking over webstores, stealing credit card details and other offenses. In return for their criminal services, the suspects were paid with Bitcoin. Two of the arrested are brothers suspected of selling credit card information. The third is suspected of aiding a terror organization transfer funds, and a gag order has been placed on the details of the case. The Rishon LeZion Magistrate's Court extended their remand until Sunday. On the forum, which started operating at the end of 2007, hackers sold malware or solicited others to install it on unsuspecting victims' computers, investigators said. Marketplace members also bought and sold stolen databases, some containing millions of people's email addresses or personal information, often used in identity-theft and computer fraud schemes. The site, which had roughly 250 to 300 active members, was seized and shut down by American authorities on Tuesday. Those arrested or searched live in the United States, United Kingdom, Australia, Bosnia-Herzegovina, Brazil, Canada, Colombia, Costa Rica, Croatia, Cyprus, Denmark, Finland, Germany, Israel, Latvia, Macedonia, Nigeria, Romania, Serbia and Sweden. There are victims in all of those countries, and others, authorities said. Hackers couldn't just log onto the site. They had to be vouched for or nominated by at least two current members to be able to buy, sell or solicit illegal wares or services on the site, authorities said. Hackers also had to present an example of their work which includes proof they hacked websites and caused harm, while leaving a personal signature. Darkode's advertised products included personal information of 39,000 people from a database of Social Security identification numbers and 20 million emails and usernames that could be used to target people for identity theft, phishing emails or other schemes. In new Twitter account, PM explains that 'the more the regime feels strong and impervious to foreign pressure, the more it increases domestic oppression'. In an 11th-hour escalation of his lobbying against an expected nuclear deal between Iran and six world powers, Prime Minister Benjamin Netanyahu turned to the Iranian public on Monday with a new Farsi-language Twitter account. An Israeli official said Netanyahu aimed to persuade ordinary Iranians they stood to lose from a deal that limits, but does not eliminate, Tehran's nuclear program because "the more the regime feels strong and impervious to foreign pressure, the more it increases domestic oppression". Israel, not a party to the negotiations with Iran, has tried with little effect to get the terms imposed on its arch-foe toughened up. The talks, held in Vienna, appeared close to yielding a deal ahead of a midnight deadline. Tweets posted on Netanyahu's new account, @IsraeliPM_Farsi, restated his argument that such a deal would "pave the way for Iran to get nuclear bombs and billions of dollars for terrorism" and that the Iranian leadership should not be engaged diplomatically while it orchestrates anti-US "hate marches" on the streets of Tehran. Netanyahu's office said the Farsi account will publish content similar to his English and Hebrew accounts to engage the Iranian people directly. Netanyahu has a popular following on Twitter and often tweets videos and photos with messages critical of the Iranian government and nuclear negotiations. Meir Javedanfar, an Iranian-born Israeli analyst, said Netanyahu's aggressive rhetoric could backfire with his Iranian audience. "I'm worried ... Netanyahu is going to cause more damage if he continues with the same messages," he said. The account quickly gained more than 900 followers, with many users mocking him and saying there was a grammatical mistake. One spotted a syntax error in the account. 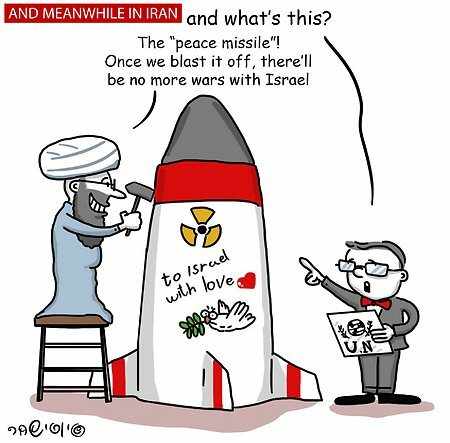 Another suggested Netanyahu might be better off "explaining with a crude cartoon" - a reference to an illustration the Israeli prime minister held up during a UN speech in 2012 to show how close Iran, which insists its nuclear projects are peaceful, was to making a bomb. Twitter, Facebook, and other popular social media sites are technically banned in Iran but Iranians are active on Twitter through proxy servers. Key leaders, including Khameini, Rouhani, and Foreign Minister Jared Zarif, all have large followings and tweet official statements. 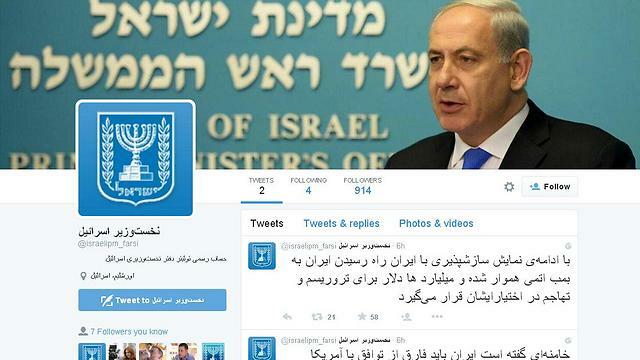 Netanyahu's office said it has not decided whether to interact with politicians on the new Twitter feed. A group of Israli caricaturists frustrated with ineffectiveness of hasbara are posting sarcastic caricatures to expose BDS supporters' hypocrisy. Israeli diplomacy has been diligently working in recent months to thwart the efforts of the Boycott, Divestment and Sanctions Movement (BDS), and now the country is receiving assistance from an unlikely group: Illustrators. A new Facebook page recently created by Israeli illustrators seeks to fight the boycott efforts via sarcastic cartoons that paint Israel in a positive light, and unmask its hypocritical detractors. After Britain's National Union of Students decided last month to join the BDS movement calling for a boycott of Israel, Asaf Finkelstein, a public relations person specializing in branding, decided that he could no longer bury his head in the sand. After consulting with his friend, illustrator Uri Fink, they decided to utilize Israel's secret weapon in order to win the hasbara fight: The art of illustration. Along with illustrator Shay Charka and public relations person Yossi Klar, they created a Facebook page called TICP - The Israeli Cartoon Project that brings together the caricatures of illustrators who want to help Israel in its fight against the boycott. "We felt that there was a huge failure in hasbara and concluded that there is one thing that has not been tried yet - to explain Israel through caricatures. We decided the time for talking is over, it's time for action," said Finkelstein. Soon word spread, and Israel's best illustrators mobilized for the country's sake. These include: Yaakov Kirschen, Ronnie Gordon, Yaron Lovaton, Yossi Shahar, Shay Charka and Guy Morad, Yedioth Ahronoth's cartoonist. 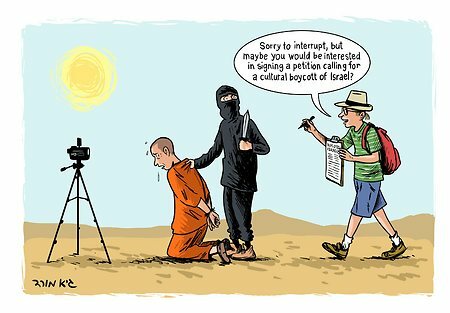 To join the illustrators' army, the cartoonist must be a talented illustrator, pro-Israel, funny, and know how to put aside Israeli political disputes. "The most important rule - no internal politics, no left and no right, no religious and no secular," said Finkelstein. "We want to reach BDS' audience and plant seeds of doubt, balance the picture and explain that the truth is not so absolute." 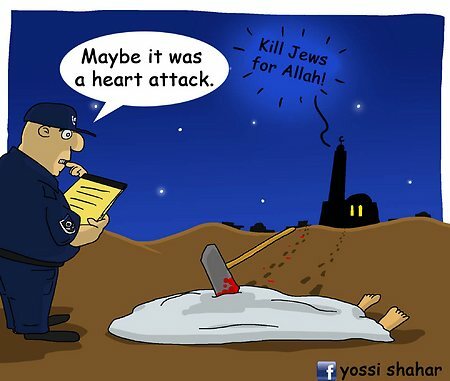 Almost every day sarcastic caricatures appear on the Facebook page demonstrating the hypocrisy of Israel's detractors and their anti-Semitic motives, in order to help shatter the web of lies they are spreading. The veteran caricaturist Yaacov Kirschen explains the strategy: "Today people do not have time to read. Those who receive a caricature will look at it for a few seconds and will immediately get the message. If you use humor, the reader also laughs, and when someone laughs, he accepts the truth, then he is on my side. We are at war, and we have to fight. This is a caricature war." Illustrator Vladik Sandler considers his participation in the project a true mission. "I listen to the international media and and am in shock at the falsifications about us," he said. "Caricatures are a way to fight against it creatively. Caricatures attract people, and if it's done in a smart and elegant way, you can create a new atmosphere that leads to dialogue." Yossi Klar, who runs the Facebook page, also believes in the power of illustration to bring about a change of consciousness: "One caricature can change the opinion of someone who does not know anything about the conflict. We strive to make them understand our right to live in our country without them trying to kill us." 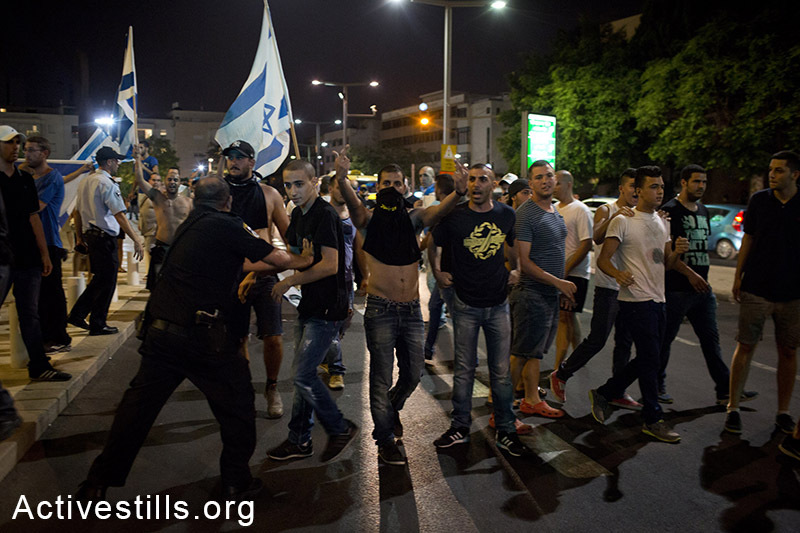 Right-wing nationalists attacking left-wing activists during a protest in central Tel Aviv against the Israeli attack on Gaza, July 12, 2014. The protest ended with the nationalists attacking a small group of left-wing activists, with little police interference. Three activists were injured and one right-wing person was arrested. 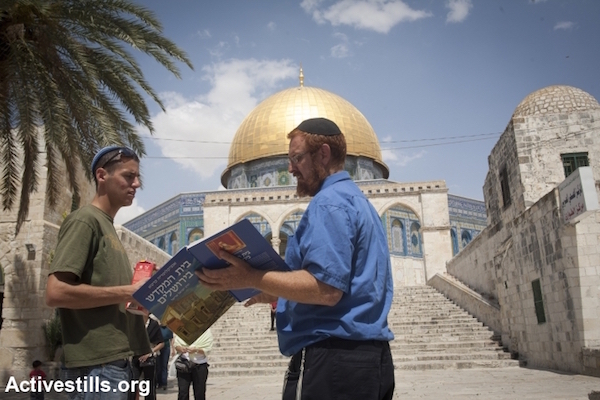 Racist and inciting Facebook statuses by Israeli Jews have become commonplace on the Internet. Yet not a single Israeli has ever been sent to prison for publishing a status on social media. The sentence is not something out of the ordinary. Sami Da’is received eight months for his posts on social media; Omar Shalbi was sentenced to nine months; and many others are still being held until the end of legal proceedings, waiting for a decision on their case. All of them for publishing statuses on Facebook. Perhaps you have noticed that there is not a single Jewish person among those arrested—this isn’t a coincidence. The following article will compare some of these remarks to those made by Jews, who were never forced to spend seven months in jail. Not a single Jewish citizen of Israel has ever been sent to prison for publishing a status on social media. 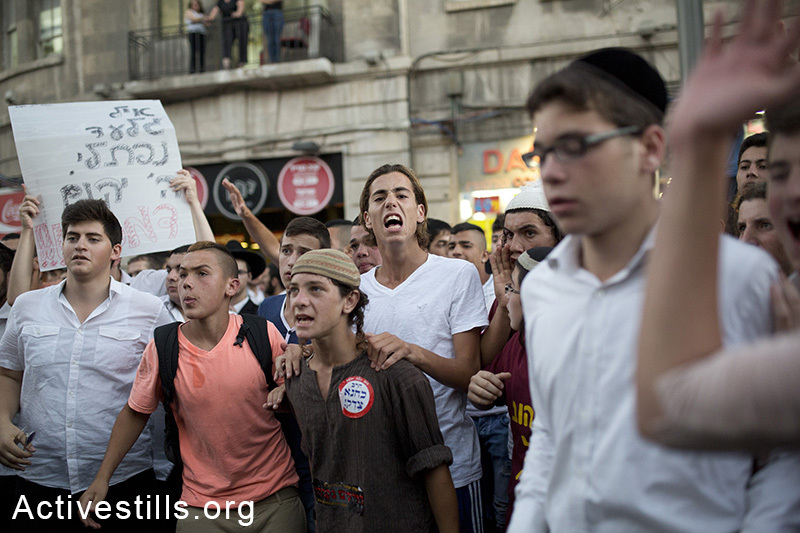 These social media users are usually accused of the following clauses in Israeli law: “incitement to racism,” “incitement to violence or terrorism,” and sometimes “support for a terrorist organization.” The first clause is simple: anyone who publishes remarks “for the purpose of inciting to racism,” regardless of the probability that the remarks will lead to violence—is guilty. According to the second clause, incitement to violence or terrorism—or praising an act of violence or terror—is forbidden only if the content of the remarks and the circumstances in which they were published include a a real possibility to lead to an act of violence or terrorism. This requires finding out whether anyone who read the status was inspired to commit an act of terrorism or violence. As for the third clause, anyone who expresses support for a terrorist organization is guilty. The court takes into account how much exposure these statuses receive when determining the defendant’s sentence. Sometimes they have over 200 likes, other times they are far less popular. Such is the case of Sami Da’is, who received five likes for one of the status mentioned in his indictment, and nine likes in another. He was sentenced to eight months in prison. After Facebook user Arkadi Yakobov wrote, “there is no shame in burning an Arab, it is a great mitzvah to burn Arabs,” armed men did not barge into his house and detain him for several months. When Galit Elmaliach agreed and added “may all the Muhammads burn, amen,” and when Hovav Yossi Mattuf swore that “the next time they kidnap, I hope he is not unconscious and is burned alive and made to run around burning” no one raised an eyebrow. Their lives went on without any interference by the Israeli justice system. When Ibrahim Abadin changed his profile photo to that of Mutaz Hijazi, the Palestinian who attempted to assassinate far-right Temple Mount activist Yehuda Glick in October of last year, it was enough to be considered a crime. When Jews such as Mor Hajaj look forward to the day that the Knesset passes a law to allow the massacre of “infiltrators,” or when Avi Swissa and Etzion Shchori expressed support for ISIS—no one broke down their doors in an overnight raid. When Naor Elmaliach and Leroy Kaufman expressed support for the Nazi regime, while lamenting the fact that Adolf Hitler didn’t massacre more of their own people—no one in the State Attorney’s Office or the police even considered serving them with an indictment. Sami Da’is, on the other hand, published the logo of the Popular Front for the Liberation of Palestine in 2014—a political party that was elected in the last Palestinian elections—as a status on his Facebook feed, adding the words “The Popular Front for the Liberation of Palestine.” This received six likes, and was mentioned in his indictment. 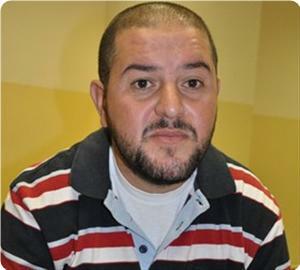 Mahmoud Asila, who presents himself as a Palestinian comedian, wrote “I opened a tourist agency for cars that run people over, meaning that every day a driver or two comes to me before a vehicular attack and then come back.” He also wrote: “Leave us and Al-Aqsa alone, and we will stop the vehicular attacks… we have a solution for the concrete blocks you have erected: we will stop using cars and start using motorcycles.” The honorable Judge Rivka Friedman-Feldman read out the translation of his remarks, and agreed with the state that he could not be left under house arrest because of the danger he posed. Instead he would have to remain in prison until the end of his legal proceedings. Shlomi Avraham, the leader of the “Al-Yahud Gang,” which sent an incited mob to attack people simply because they are not Jewish, was sentenced to house arrest and did not have to wait months in jail for a decision on his case. It is impossible to describe how far this kind of incitement reaches. But those who are interested can find support for military operations, such as the racist celebration following the killing of four boys on the Gaza beach last summer, or a worker in the Finance Ministry who calls for the murder of Arabs. Other users did not refrain from expressing support for the Nazi regime when replying to a Holocaust survivor who criticized Israel during Operation Protective Edge. 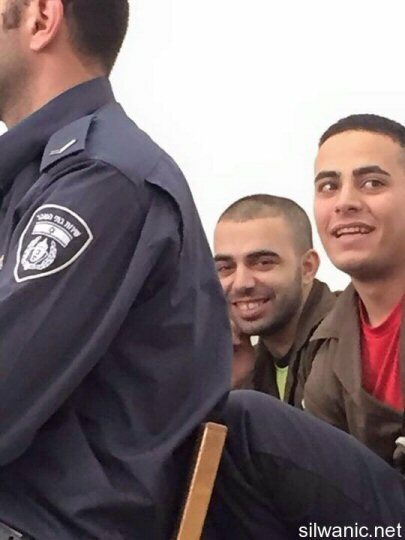 Even soldiers didn’t refrain from taking part in the incitement to murder Arabs. Neither did police officers. The post received over 4,900 likes and more than 1,200 shares, as well as many racist, murderous replies. Eighteen hours later, Muhammad Abu-Khdeir was kidnapped from his neighborhood in East Jerusalem and burned alive. Shaked quickly removed the status. She was never interrogated for her blatant and extreme incitement, and less than a year later she was appointed as Israel’s justice minister. On the same day, the secretary-general of World Bnei Akiva (the largest religious Zionist youth movement in the world) called for the murder of at least 300 Palestinians, as well as to cut off their “Philistine foreskins.” A few hours earlier, Jerusalem City Council member Aryeh King openly called to commit an “act of Pinchass,” a religious code word for murder. 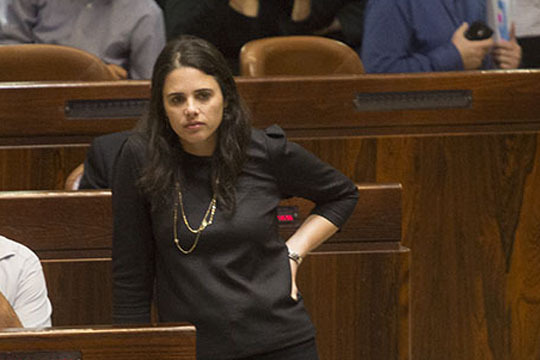 On July 10, 2014 Shaked once again used her Facebook page for incitement, and lied about who was behind a fire that erupted at a Jewish cemetery. Like the previous post, she received a great deal of racist, blood-thirsty replies. This post was also later erased. Neither Shaked nor any those who replied to her were even interrogated. Neither was King or the secretary-general of Bnei Akiva. No one was indicted, convicted or jailed. The problem goes far beyond social media outlets. On July 23, 2012, MKs Miri Regev (Israel’s current minister of culture and sport), Danny Danon, and Yariv Levin incited against asylum seekers during a protest in south Tel Aviv. Standing in front of the crowd, Regev called asylum seekers a “cancer in our body.” She later lied and claimed that she meant that the phenomenon of asylum seekers is akin to cancer. Minutes after the rally ended, a mob set out to attack asylum seekers and their property. Neither of the three members of Knesset were taken in for questioning. On the other hand, the court had no problem sending Sheikh Raed Salah to prison for incitement during one of his sermons. I write this not out of support for any of the things that were published. I can find hundreds of additional examples of inciting, racist and disgraceful statuses written by Jews. I can also quote more indictments of Palestinians for their statuses. But there is no point; we do not live in a state where citizens are equal before the law. Former contestant on Israeli singing competition, Adi Lederman, takes plea bargain, confessing to computer trespassing and infringement of privacy and property rights. A former contestant in Israel's version of "American Idol" was jailed for 14 months on Thursday for selling demo tracks he stole from Madonna's latest album by hacking into the email and cloud accounts of people close to the singer. Under a plea bargain at Tel Aviv Magistrate's Court, Adi Lederman confessed to computer trespassing and infringement of privacy and property rights in connection with the offences, committed last year. He was also fined 15,000 shekels ($4,000). According to court papers, Lederman sold demo tracks from Madonna's album "Rebel Heart" to two buyers at $300 each, having copied the files from cloud accounts whose passwords he obtained after hacking email servers used by her musical director Kevin Antunes, talent manager Guy Oseary and two other people. Lederman also obtained parts of Madonna's work diary. "The ease with which crimes such as this can be committed by those who have skills in the field, such as the accused, require an appropriate punitive response that has a deterrent and uncompromising message," the court said in a statement. Arguing for leniency, Lederman's lawyer told the court that his client was "not someone with a criminal mentality, but rather, a very fired-up and impassioned collector who went too far". Lederman had health problems, said the lawyer, declining to detail these for the court record out of privacy concerns. Lederman, 39, was arrested in January after an investigation assisted by the FBI. Unfinished tracks from "Rebel Heart" had leaked online a month earlier. Madonna has said the crime was an "invasion into my life - creatively, professionally and personally (that) remains a deeply devastating and hurtful experience". 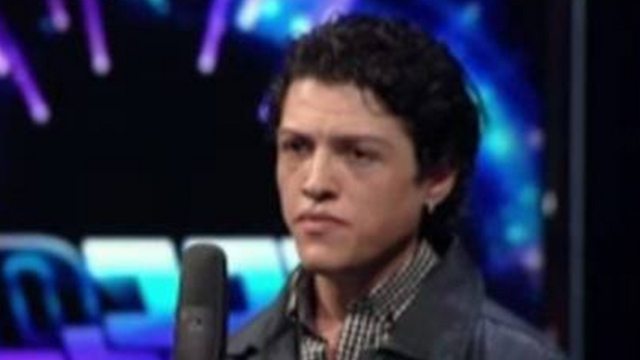 Lederman previously made a brief appearance on "A Star Is Born", Israel's version of "American Idol", before being voted off. Palestinian Facing 18 Months over Facebook "Incitement"
An Israeli court in Jerusalem, Thursday, sentenced a Palestinian man to 18 months in prison over allegedly using the social media website Facebook as a mode of "incitement." Misbah Sbeih Abu Sbeih, 38, was given a one year sentence as well as a six month suspended sentence for incitement, and his phone was confiscated as the tool used for the crime, according to head of the Jerusalem detainees families committee Amjad Abu Asab. Abu Sbeih was detained by Israeli forces on Jan. 12, 2015, during a court hearing for his son Ezzedin. His sentencing comes as Palestinians are regularly detained by Israeli forces for posting on Facebook. On June 30, Israeli forces rearrested Tareq Qurd, 21, from his home in occupied East Jerusalem hours after he was released following a six-month detention for similar charges. Qurd was one of eight Palestinians convicted of "incitement via Facebook" in December last year. Their indictment said that Israeli intelligence had monitored the men's Facebook postings since June 2014, after three Israeli settlers were kidnapped and killed in the occupied West Bank. The intelligence said that their online comments had raised tensions across Jerusalem and encouraged acts of "terrorism." They cited in particular postings on the murder of 16-year-old Muhammad Abu Khdeir, who was kidnapped and killed by a group of Jewish extremists in July, as well as on a spate of Palestinian attacks on Israeli military and civilians that mostly took place in occupied East Jerusalem. Israelis on social media routinely and openly incite violence against Palestinians, especially during heightened periods of tensions such as last summer's military offensive on Gaza, but none have yet faced prosecution. In recent months, the Palestinian Authority has also arrested Palestinians over postings on Facebook that have been critical of the PA and the Palestinian security services. Two Convicted of "Incitement on Facebook"
The District and Magistrate judges sentenced on Sunday four young Jerusalem men, according to the Wadi Hilweh Information Center. Al-Dameer organization lawyer, Mohammad Mahmoud, explained that the district judge sentenced Tarek Kurd for six and a half months of actual imprisonment and a suspended probation of six months for three years. The lawyer added that the Magistrate judge sentenced Fouad Rweidi for 8 months of actual imprisonment, a suspended probation of six months for three years and a 3-thousand NIS fine. He also explained that Kurd and Rweidi were convicted on “incitement” on Facebook and have been under arrest since the end of last year. In a related matter, the Magistrate judge sentenced Isam Anati for 5 months of actual imprisonment a suspended probation of six months for three years, and Ghaleb Shallodi for six months and one day of actual imprisonment a suspended probation of six months for three years. The Israeli District Court in occupied Jerusalem sentenced, on Monday morning, a young Palestinian man to 13 months of imprisonment, with an additional four months suspended, for what the court called “incitement,” on his Facebook page. Mohammad Mahmoud, a lawyer with the Ad-Dameer Prisoners’ Support and Human Rights Association, said Odai Mofeed Bayyoumi, 23 years of age, was taken prisoner on December 16, 2014. Bayyoumi, from Kafr ‘Aqeb neighborhood, in Jerusalem, was transferred to different detention centers since his abduction. On Tuesday, May 19, an Israeli court sentenced a Palestinian man to eight months of imprisonment, with an additional six months suspended, for activity on social media. 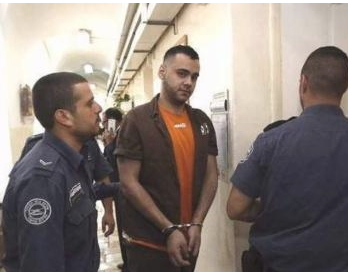 The Jerusalem detainees' families committee said that the Israeli magistrate's court had handed the sentence to Sami Jamal Faraj Ideis, 28, from Shu’fat after he was convicted of inciting anti-Jewish violence and supporting "terror" in posts and comments on Facebook. Gov't cartoon satirizing press coverage in Gaza removed after outcry and accusations of direct attack on reporters. The Foreign Ministry on Sunday removed the online animated video it produced satirizing coverage of the Gaza Strip by foreign journalists, which angered many members of the press stationed in Israel. Journalists expressed confusion about the government's motive for the mocking clip. Media outlets worldwide have reported on the mocking video, including the Washington Post and the New York Times. The short video shows a foreign correspondent being interviewed on his perspective on life in the Gaza Strip, while the reality of the situation unfolds behind him. 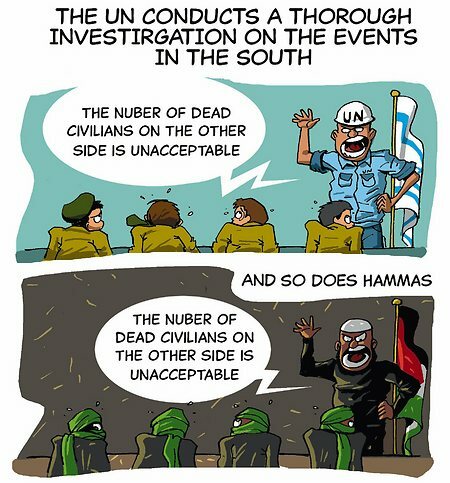 The journalist makes claims about the peaceful, democratic nature of Hamas rule. The film ends with the appearance of another reporter, who hands her colleague a pair of glasses. "Maybe now you'll see the reality of life under Hamas rule," she says. The reporter dons the glasses, and faints away once he sees "the reality." Foreign Ministry Spokesman Emmanuel Nahshon defended the controversial video, which had both foreign and Israeli reporters up in arms on social media. He said the video was "poking gentle fun at the phenomenon" of Hamas allegedly using "human shields" during fighting and only "partial reporting" of this by international media. On the New York Times' website, Ernesto Londono stated flat-out about the video: "It was lame. It wasn’t funny. It was offensive." The Foreign Press Association in Israel issued a statement deploring the video. The Association was "surprised and alarmed by the Israeli Foreign Ministry's decision to produce a cartoon mocking the foreign media's coverage of last year's war in Gaza," read the statement. "At a time when Israel has serious issues to deal with in Iran and Syria, it is disconcerting that the ministry would spend its time producing a 50-second video that attempts to ridicule journalists reporting on a conflict in which 2,100 Palestinians and 72 Israelis were killed. "Israel's diplomatic corps wants to be taken seriously in the world. Posting misleading and poorly conceived videos on YouTube is inappropriate, unhelpful and undermines the ministry, which says it respects the foreign press and its freedom to work in Gaza." Meanwhile, Paul Mason of the British Channel 4 said the video was insulting and a direct attack on foreign journalists. The Washington Post's correspondent in Israel, Ruth Eglash, said the video did not reflect reality and that it was unclear why the Foreign Ministry was insulting foreign journalists instead of holding a serious dialogue. Foreign Ministry sources said they were surprised by foreign journalists' outrage and that there had been no intention of offending anyone. "During Operation Protective Edge rockets were fired from populated areas and near public structures," said the Ministry. "All this was well-known and documented. But incriminating photos were published only later, with a notable delay. The claim was fear of Hamas. The video looks at this phenomenon in an amusing way." Foreign Press Association condemns foreign ministry cartoon as 'inappropriate' after 17 journalists died in Operation Protective Edge. A 49-second cartoon clip produced by Israel's Foreign Minsitry and entitled "Open your eyes about Gaza," quickly drew condemnation from the Foreign Press Association (FPA) in Israel, whose members were offended at what they saw as a mockery of their coverage during last year's Operation Protective Edge in Gaza. 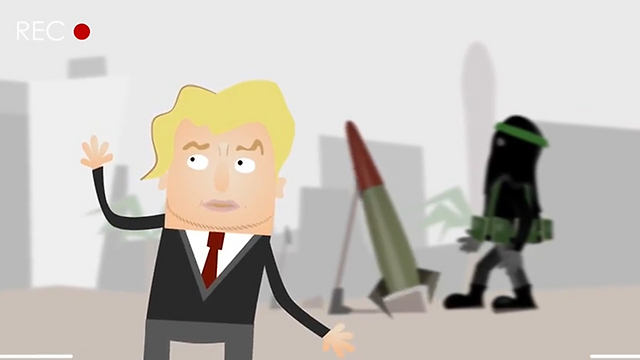 The video features a blonde-haired television correspondent in Gaza with an American accent declaring to camera "there are no terrorists here, just ordinary people", while a masked militant fires off a rocket in the background, presumably towards Israel. A female character then gives the reporter a pair of glasses, allowing him to see the reality of "life under Hamas rule". The reporter then faints. The FPA said it was "surprised and alarmed" by the "misleading and poorly conceived" clip. "It is disconcerting that the ministry would spend its time producing a... video that attempts to ridicule journalists reporting on a conflict" that killed 2,200 Palestinians, mostly civilians, and 73 on the Israeli side, mostly soldiers. It described the video as "inappropriate" and "unhelpful." Some 17 journalists were killed covering the July-August Gaza war, the bloodiest yet in the tiny coastal territory, including an Italian photographer working for Associated Press. Foreign ministry spokesman Emmanuel Nahshon defended the controversial video, which had both foreign and Israeli reporters up in arms on social media. He said the video was "poking gentle fun at the phenomenon" of Hamas allegedly using "human shields" during fighting and only "partial reporting" of this by international media. The international media reported during the conflict on the alleged use of civilian sites by Palestinian militants to store weapons and fire rockets. Israel carried out deadly strikes on several UN institutions, including schools where displaced civilians were sheltering, saying Hamas's actions forced it to target those areas. 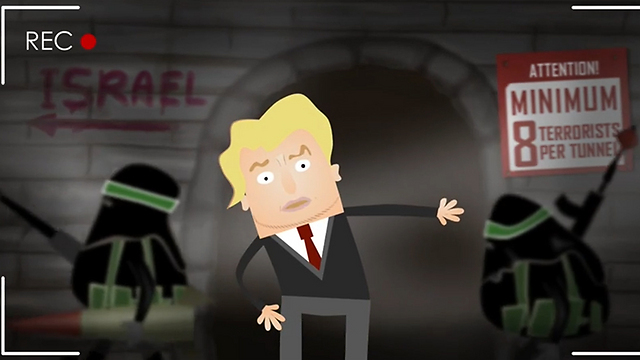 Animated video shows foreign journalist taken in by Hamas propaganda, until he dons a pair of glasses to see the reality. Less than 24 hours after releasing its own preemptive report into IDF activity during last year's Gaza conflict, Israel is keeping up its public advocacy campaign on social media. The Prime Minister's Facebook and Twitter accounts have uploaded infographics highlighting the key findings in the report, and the Foreign Ministry has even decided to take things one step further, with a satirical piece of animation entitled "Open your eyes to what is happening in Gaza." perspective on life in the Gaza Strip, while the reality of the situation unfolds behind him. "We are here in the center of Gaza, and as you can see, people here are trying to live quiet lives," says the reporter. "There are no terrorists here, just ordinary people." Meanwhile, behind him a terrorist carrying a rocket walks past a woman in a burkha with a baby carriage and then launches a rocket. The reporter then moves on to what he calls "Gaza's underground city", while in the background members of the Hamas military wing carry missiles and weapons, apparently following a sign directing them to Israel, and a poster on the wall reads: "MINIMUM 8 terrorists per tunnel." "This is a fascinating attempt by Hamas to build a subway system," says the reporter. "This is actually the first Palestinian subway, which will bring Gaza's transportation system into the 21st century." The third scene in the video shows the foreign correspondent standing in front of a Palestinian with a rainbow flag. "There is no doubt that the Palestinian society here is liberal and pluralistic, and Hamas allows everyone to live in dignity," says the reporter, as an armed Hamas activist throws a bag over the man's head and carries him away. The film ends with the second journalist saying: "Open your eyes, terror rules Gaza." 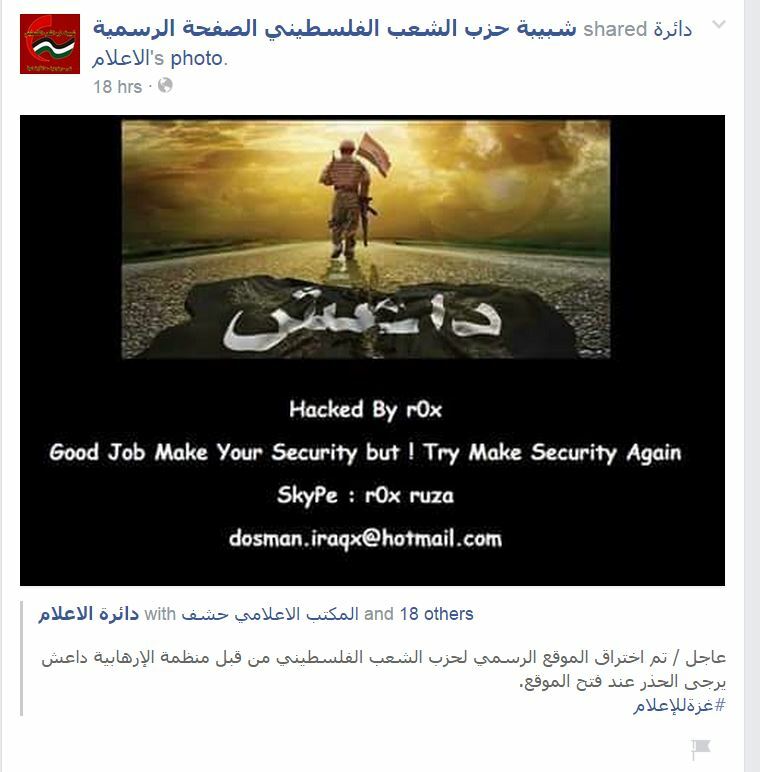 Hackers claiming to be affiliated with the ISIS (Islamic State of Iraq and Syria) group defaced the official webpage of the leftist Palestinian People Party (PPP) on Wednesday. The cyber-attackers replaced the homepage of the site with an image that included a written text saying in bad English “hacked by r0x, Good Job Make Your Security, but! Try to make it again,” in addition to providing Skype and Hotmail addresses. On its Facebook page, the PPP confirmed its main webpage was attacked by hackers claiming to be affiliated with the ISIS group, and advised the readers to be alert when trying to access the page. 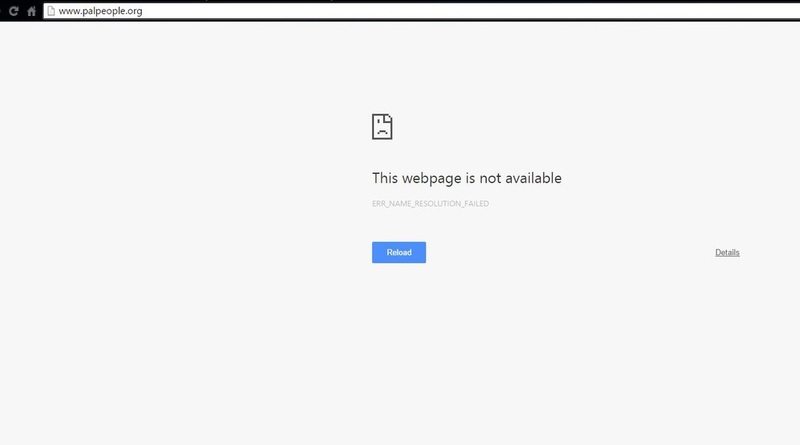 The PPP webpage was still offline as of Thursday morning, with its front page showing “this page is not available”, instead of the image that the hackers uploaded.